I am just leaving this here. You do your own commenting. I mean, I get why people would be upset…..but dude has not been convicted yet, right? I don’t think anyone doubts his guilt but we have a process for a reason. No reason to make it easy. And I suspect the Democrats won’t be that concerned with due process if they manage to pass stupid gun laws. Process? So we can take someone’s firearms from him when they have committed no crime by using a red flag order that is based upon social media posts that someone found objectionable, but cannot take the right to vote from someone who admittedly slaughtered children? Seems to me that is having it both ways. Either your rights are intact until convicted, or they are not. Every. Vote. Counts. Heh…… or …. Vote as if your life depends on it. Uhh. So I guess I understand why you wouldn’t comment. On the one hand, the guy is a POS. On the other hand, he hasn’t been convicted of anything and it would be pretty hypocritical of people who complained about the sheriff not doing his job to advocate that the sheriff not do his job and not afford those still eligible to vote the opportunity to vote, right? And on top of that, he’s a Republican. What I don’t understand is Mr. Pollack pointing his finger at Democrats. It’s the Constitution that’s at fault here…at least from Mr. Pollack’s perspective. 1) Had the local Democrats done the jobs they were elected to do, the lunatic wouldn’t have been walking the streets to commit murder. 2) Had the local Democrats done the jobs they were elected to do, one of them might have acted to stop the shooting before the body count reached that limit. 3) Had the local Democrats done the jobs they were elected to do, they might have reached some of the victims in time to save their lives. 4) Had the local Democrats done their jobs, the Florida elections would be settled and they wouldn’t be once again playing with starting a civil war. 5) In a previous case, had the local Democrats done their jobs, Trayvon Martin might have learned that he wasn’t invincible and NOT jumped and threatened the life of an armed man. 6) The Democrats are generally in favor of stripping the rights from the law-abiding while extending ever more rights to career criminals. This starts with the people they choose to run for office and extends all the way to their preference to impoverish law-abiding American citizens and import millions of criminals from the third world. Oh, and here’s more for my last point: Democrat “sanctuary city” policies just released a triple murderer. Because he’s an illegal.Democrats love placing their chosen people above the law, while passing more and more laws for the rest of us to live by — or else. Here in NY, mighty Progressive Monarch Andrew Cuomo has been paroling cop killers and restoring their voting rights. Previous PostPrevious If you are not ditching your Smart Speaker by now. 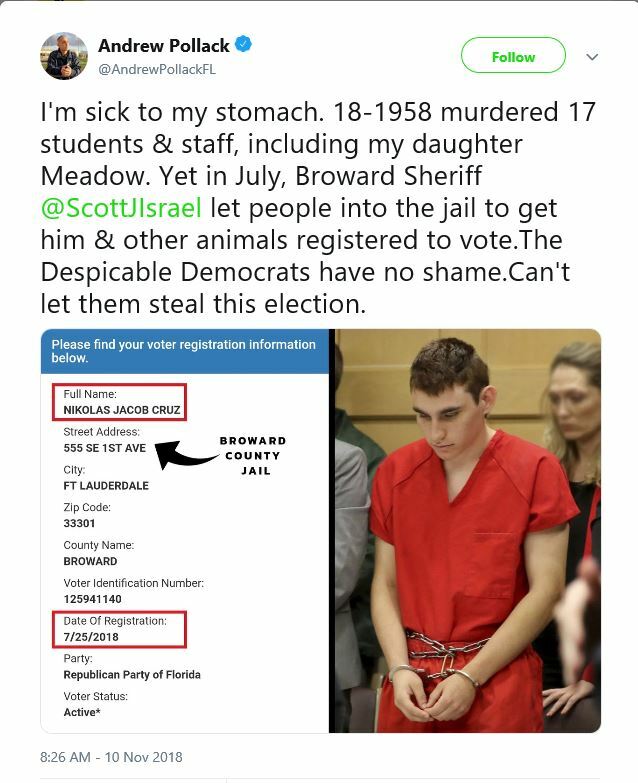 Next PostNext Broward County Elections impressing the competition.